1. Our political system has deteriorated to the point where each side of the political spectrum is willing to push to the very brink of disaster before even the most basic remedial action is taken. 2. The “level” of the debt is really not the issue; it is the growth rate of that debt relative to the growth of the economy. These issues raise the level of uncertainty in the economy and therefore stymie private-sector growth and job creation. All credible projections of federal spending show that Social Security, Medicare/Medicaid and other social spending programs will explode in the coming years unless Congress and the president do something to fix the situation. In 1982, projections were that Social Security faced insolvency by 1990. But, that didn’t happen because President Reagan and House Speaker Tip O’Neill reached a compromise and a solutionthat kept the Social Security program viable for a while longer. When Congress and the president confront the spending issues, their choices will be to raise taxes, reduce benefits or, via compromise, some combination of the two. But we know that they won’t act until the spending issues become a recognizable crisis and/or their political futures require that they act. This is most likely to come in the form of “invisible hand” economic actions wherein the dollar drops in value relative to other currencies and interest rates rise, as the international community relies less and less on the dollar as the world’s reserve currency. China and Russia are becoming more and more vocal and active in seeking alternatives to the dollar in world trade. If the necessary spending controls aren’t soon put in place, the U.S. economy could lose its premier status. Don’t underestimate the importance of the “reserve currency” status in the economic growth equation. One argument in the current bickering is that the country will never be able to repay the $17 trillion of debt it has accumulated. From an economic point of view, the debt level itself isn’t the issue. The issue is how fast that debt is growing and its cost. Unlike an individual whose debts all come due upon death(either the estate pays the debt off or the lender(s) writes it off), a country doesn’t die (without a revolution). As long as the growth rate of the debt is less than the growth rate of the economy, and as long as interest rates remain reasonable, the debt will never be expected to be repaid. From this point of view, the most significant single statistic is the debt’s relationship to GDP. The concept is similar to that of an application for a mortgage. The borrower needs a reasonable “debt payment/income ratio” to qualify. The more pre-existing debt one has, and the more of one’s income it takes to service that debt, the less credit worthy the individual becomes. After World War II, the debt/GDP ratio was 120 percent. Why wasn’t it a disaster then? The answer: 1) the war had ended and spending was reduced; and 2) the economy grew faster than the debt. By 1974, the debt/GDP ratio had fallen to 32 percent. It rose after that to 66 percent in 1996 after the recession of the early ’90s, but fell to 56 percent during the strong economic growth years of the late ’90s and the spending-control emphasis of the Congress (which was accepted and then embraced by President Bill Clinton). By 2008, as a result of the 2001 recession and debt growth outpacing economic growth during the Bush presidency, the ratio rose to 70 percent. Then came the financial crisis and the recession with weak economic growth in its aftermath. The debt/GDP ratio now stands at more than 100 percent, a level that makes the international community nervous. There are two key concepts here: 1) controlling the size of the fiscal deficit to control the growth rate of the debt (this implies confronting the growth rate of the social programs); and 2) growing the economy fast enough to accommodate a rising level of debt. Spending, entitlement growth, the growth of the debt and economic growth are all intertwined. Since the spending issues were taken off the table in this week’s debt ceiling bill, the only chance at avoiding a true debt crisis is for the economy to grow. Such uncertainty clearly shows up in all of the business surveys as holding back economic growth and job creation. For everyone’s benefit, it behooves Washington to put some degree of certainty back into the business markets, at least for a long-enough time period to allow a return on new capital deployment. The longer-term question is whether or not federal spending growth will allow the debt/GDP ratio to decline. If it does, then the fiscal issues in Washington, D.C., will disappear, just as they did post-World War II. Unfortunately, the current way the government runs almost guarantees that spending will continue to probe the limits of the debt/GDP ratio. If this doesn’t change, one might want to prepare for those “invisible hand” economic implications. NEW YORK (TheStreet) — After nearly eight years of trying to make the Federal Reserve more transparent, in one stroke Chairman Ben Bernanke has undone much of that effort. In May, he telegraphed the “taper” of the Fed’s “Large Scale Asset Purchase” program (known as LSAP to Fed economists and quantitative easing, or QE, to Wall Street) based on a strengthening economy and labor market. The market reacted by pushing 10-year Treasury yields to nearly 3% from 1.6%, one of the most rapid backups in yields on record. Then, in the face of that strengthening economy and labor markets, last Wednesday, Bernanke pulled the rug out. The Data: Except for the Bureau of Labor Statistics’ (BLS) August unemployment report, almost all of the underlying data underscore a strengthening economy. Both ISM manufacturing and non-manufacturing indexes for August were strong, with the non-manufacturing index setting a record high. The employment sub-indexes were no exceptions. Initial unemployment claims have been in a steady and steep downtrend since 2010. The week of Sept. 7 saw this number at 294,000, a number not seen since April 2006. The four-week moving average, considered more reliable, at 314,750, hasn’t been this low since October 2007. The Fed’s own economists have indicated that concerns over “structural” employment issues (i.e., labor force drop-outs) have been overdone. Job openings in the private sector are higher than at any time since 2008, and employers complain they cannot find qualified candidates. Thus, based on labor market conditions, which Bernanke indicated was key, in conjunction with the lack of success of the LSAP programs in stimulating economic growth (also according to the Fed’s own economists), the “taper” should have occurred. After months of “taper” talk and years of trying to promote transparency, last Wednesday, something else happened. We don’t know what it was — yet. Maybe we will find out soon, or maybe we will have to wait for Bernanke’s memoirs. •The Fed misread the August employment report. This doesn’t seem possible. As outlined above, all of the underlying employment data are much stronger, not weaker than last spring. Also, the Fed knows that the BLS heavily massages the employment releases. The concurrent seasonal adjustment process used by the BLS, where each month the entire year’s series is recalculated but not released to the public, makes it not only possible but highly probable that the weaker August release simply reflected catch-up from the frail first and second quarters. So, while the August BLS numbers could be used as an excuse, they surely cannot be the underlying reason. •The market reaction to the May “taper” announcement was more than the Fed anticipated and interest rates backed up too fast. The Fed may be concerned over the impact of higher rates on the nascent housing recovery. After all, the QEs seem to be aimed squarely at housing (the purchase of Mortgage Backed Securities in QE3) and the equity markets. But if this were the case, the Fed could easily jawbone rates lower, even in the face of the initial taper. In fact, many market pundits thought that rates would fall if the “taper” amount was as anticipated ($10 billion to $15 billion). •There is a third possibility, one that is purely speculative on my part: Bernanke has decided that he wants another four-year term as chairman. Of course, that requires a White House nomination. Recognizing that nothing happens in Washington that isn’t manipulated or controlled, the events of the past 10 days surrounding the Fed seem too coincidental not to be related. It is clear that while the markets want Janet Yellen to be the next Fed chair, the White House is not keen on her. Perhaps the “no-tapering” announcement was the quid pro quo between Bernanke and the White House and that Lawrence Summers’ formal withdrawal of his name from consideration (quite unusual, since there was no formally announced candidate list) was part and parcel. After all, a rising stock market is always desirable for the White House’s occupant. Conclusion: History will eventually sort all of this out. Meanwhile, one thing is clear: The eight years of effort to make the Fed more transparent and credible have been dealt a serious blow. Last Wednesday, with the “no-taper” announcement, the Dow Jones Industrial Average rose 147 points. Since then, it has fallen 226 points, with a loss of 185 on Friday, as the markets have begun to rethink the implications. In the end, without Fed credibility, markets will be more uncertain and, therefore, more volatile. Despite what was widely viewed as a weak employment report in early September, the U.S. economy appears to be on solid footing. Both ISM manufacturing and nonmanufacturing indexes for August were strong, with the nonmanufacturing index setting a record high. Initial unemployment claims have been in a steady and steep downtrend since 2010. Job openings in the private sector are higher than at any time since 2008, and employers complain they cannot find qualified candidates. So, while we aren’t quite in a boom, put any thoughts of recession on the back burner. But, make no mistake, inflation lies ahead. The No. 1 reason for this inflation forecast is the inability of governments at all levels, but especially the federal government, to rein in spending. At least once each year, we are treated to a confrontation between left and right over budgeting, spending and the deficit. But, nothing is ever resolved — the can is just kicked further down the road. The table above uses Congressional Budget Office baseline forecasts, which are quite optimistic. The table displays the baked-in growth in federal spending as a percentage of total economic output (gross domestic product). 2020 is only six years away, and 2030 but 16. From 1959-2008, the average revenue of the federal government as a percentage of GDP was 18.1 percent. For 2013, year to date, it is 16.9 percent. To balance the budget in the next six years, current tax rates must rise 43 percent. To balance it by 2030, those tax rates have to rise 59 percent. And these data points come from optimistic CBO forecasts. In an economy that the Fed considers so sluggish so as to not start its “taper” process, it is unlikely that taxes can be raised to these levels. Furthermore, the middle class, which pays most of the taxes, is rapidly shrinking due to the stealth inflation that has sapped their purchasing power. And, of course, the political chasm and resulting gridlock between the left and right has made addressing the automatic growth in federal spending essentially impossible. The big story of the week was the fact that the Fed decided to keep the pedal to the metal (the “no taper” announcement) and the rapid growth in its balance sheet, which, essentially, is the creation of money that the banking system can lend several times over, continues unabated at $85 billion per month. Wall Street, the main receptor of the Fed’s largesse, sent the equity averages to all-time highs. But the Fed’s credibility took a hit, especially since the chairman telegraphed the “taper” way back in May. The very next day (Thursday), both jobless claims and existing home sales showed a much stronger underlying economy than expected. The markets now are questioning the Fed’s ability to even read the underlying trends. Since the financial crisis, the Fed’s balance sheet has grown about $3 trillion, from about $800 billion to more than $3.6 trillion. During that same time period, U.S. Treasury debt outstanding has grown from $10 trillion to $17 trillion. In effect, the Fed has “monetized” 43 percent of the new debt over this period. Given the growth in automatic federal spending, it appears that monetizing the debt will be a major function of the Fed. • The economy is stronger than the Fed thinks and the unemployment report intimated. • This is the first Fed in modern history to advocate higher rates of inflation (2.5 percent). Don’t be fooled; do you think that when the official CPI reaches 2.5 percent, it will automatically stop there because that is the Fed’s target? • The rapid growth in automatic federal spending over the next few years will require the Fed to continue its large-scale asset purchases, just to support the Treasury’s need to issue debt and to keep interest rates down. Otherwise, the cost of interest alone will overwhelm the federal budget. The alternative, much higher taxation, is not politically viable. • Ultimately, the dollar will weaken as the world recognizes that dollar debasement is occurring. Note that on the day of the Fed “no taper” announcement, gold rose by $55 an ounce. Market players aren’t stupid. • Meanwhile, enjoy the continuation of the Wall Street party. But, beware of the inflation hangover. If the Fed were a publicly traded company, Wall Street would trash its stock based on the credibility of management, the failure of its policies, the loss of confidence of major constituencies and a weak — if not insolvent — balance sheet. If the typical U.S. family buying the median-priced home had purchased in May at $250,000 with a 20% down payment with a Freddie Mac 30-year fixed-rate loan, the principal and interest payment would have been $881 a month. By August, the principal and interest payment on a similar home costing the same amount with the same down payment would be $1,023 a month. The authors found that in the QE2 program, the asset purchases alone added only .04 percentage points to GDP. That’s about $6.4 billion — not much considering that QE3 purchases are currently $85 billion each month. Market participants have to be asking the question: What happens if the U.S. budget deficit rises back toward $1 trillion, as expected, and foreigners and the public have stopped buying? The Fed is either going to have to allow rates to rise to the point where foreigners and the public will buy again, or the Fed will have to continue the QE program and become the major purchaser of the Treasury’s debt. Those of us old enough remember that in the early ’80s, when then-Fed Chairman Paul Volcker allowed rates to rise, two recessions resulted (January 1980-July 1980, and July 1981-November 1982). If we’ve reached this point, one must question the credibility of the Fed’s policies. The Fed announced in March that it intended to hold all the securities on its balance sheet to maturity. The Fed has its own accounting principles and does not record mark-to-market losses. But, what if the Fed had to tighten policy by selling assets, i.e., traditional open market operations? It would have to record the losses. With rates at current levels (as of Aug. 25), it is likely that the $55 billion of Fed equity capital (as of July 24), which is a mere 1.5% of assets, has already been wiped out on a mark-to-market basis. My conclusion can be only that with a dysfunctional and confused Federal Open Market Committee, strategies that have failed to achieve stated objectives, a loss of confidence by major constituencies and a weak if not insolvent balance sheet, if the Fed were a publicly traded institution, Wall Street would savage its stock. The Seinfeld TV comedy series (1989-1998) had a set of episodes, known as Jerry’s Bizarro World, where everything “normal” was turned upside down and inside out. The Fed seems to have accomplished something similar with its experimental Quantitative Easing (QE) policies. For the first time in a long time, underlying economic fundamentals are turning positive. Ordinarily, this would be good news for investors. But in today’s upside down, topsy turvey, bizarre markets, “good” news is bad for investors. The blame for this is squarely on the Fed’s QE policies and similar policies adopted by other central bank mimes. In the labor markets, job openings continue to be hard to fill (JOLTS report), layoffs and firings are at levels not seen since ’07 (Initial Jobless Claims week of August 10), and Voluntary Quits (“Take This Job and Shove It”) are rising. The consumer appears to be holding her own (retail sales) and deleveraging appears to be on its last legs (rising credit card and auto debt). Europe looks like it has bottomed (positive Q2 GDP growth) and the news from China shows higher growth levels than penciled in by the pundits. Normally, such news would be accompanied by rising equity prices. But not this time. 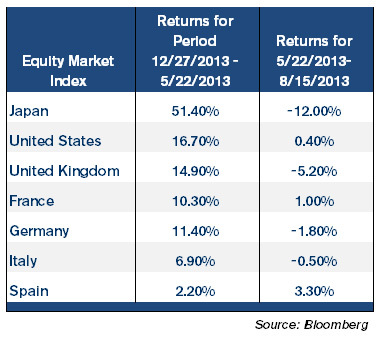 In the U.S., the U.K., Europe, and Japan, recent positive economic data has been met with equity market sell offs. On August 15th, the Dow Jones sold off 218 points despite 5 year lows in jobless claims, a continuation of positive retail sales trends, and high and rising home builder confidence, a good leading indicator of future home sales. The table shows the performance of the world’s equity markets with activist central banks for the year until the Fed’s “tapering” announcement on May 22nd, and then from May 22nd to August 15th, the date of this writing. Note that until May 22nd, the markets with activist central banks performed quite well despite relatively stagnant economies, but after the “tapering” announcement, equity prices have been less than stellar. Normally, during the first signs of a change in policy toward tightening, what we find is both rising interest rates and rising stock prices because monetary policy tightening means a strengthening economy. David Patterson of Brandywine Trust Group, in an August 15 Wall Street Journal piece, opined that markets no longer move on fundamental economic data, but on anticipated Fed policy moves. In fact, it isn’t so much the policy change itself that moves the markets, but whether or not that change was more or less than anticipated (i.e., the 2nd derivative). Patterson’s premise is that the market knows that the Fed is counting on the “wealth effect,” via a rise in equity prices, to have an impact on consumption, and anticipates and discounts Fed actions to achieve that “wealth effect.” If the Fed acts (or fails to act), and its actions (or lack thereof) disappoint market expectations, equity prices react negatively. As a result, because “good” fundamental economic data means a stronger economy and less need for monetary accommodation, we now have the bizarre world where “bad” fundamental economic news moves the markets higher, while “good” news does the opposite. That is, “bad” is now “good,” and “good” is “bad.” Patterson sums up the Fed’s Bizarro World as follows. There are no special attributes of wisdom that are automatically imparted to the Fed’s Chair at his/her swearing in ceremony. The non-traditional policies adopted by the Bernanke Fed, and mimicked by other major central banks, are experimental. Going in, they did not know what the unintended consequences would be. But now we are getting a glimpse. At this writing, we do not know how the Fed’s September decision about the “tapering” of its QE program will impact the equity markets. Will it disappoint, or not? But, what we do know is that in the Fed’s new bizarro world, whatever that decision may be, and whether it disappoints market expectations or not, market reaction will not be tied to economic reality. “Stagflation” is a term coined in the ‘70s. It means high levels of inflation in a stagnant or sputtering economy. Sadly, while unrecognized by today’s media and political factions, Stagflation is a reality. The fact that today’s Fed is actually espousing inflation is truly scary. Their traditional role is that of inflation fighter, not inflation enabler. Worse, the inflation measure used is significantly biased to the downside. The accompanying table shows the impact of various levels of inflation over 10 and 20 year periods. As seen from the table, even low rates of inflation lead to unacceptable results over time. But the 5% and especially the 10% scenarios are true wealth killers. While the “official” CPI inflation rate appears low today, it is based on a flawed methodology, which, over time, has caused it to be close to meaningless as a measure of the cost of maintaining a standard of living. In 1983 and again in 1995/96, the calculation of the CPI was modified to reflect a much lower inflation rate. While this has saved the government a huge sum in entitlement costs, the recipients of such entitlements have suffered significant standard of living reductions (see the work of John Williams at Shadowstats.com and Ed Butowsky at Chapwood Investments for details on how the CPI understates true inflation). Ed Butowsky and his firm, Chapwood Investments, regularly survey the top 500 items on which Americans spend their after tax dollars. According to Butowsky, “the CPI increase from 2008-2012 was a total of 10.2%, but our research has shown that for many cities, the cost of living increase was more than that for just 2012.” Look at the 10.0% row in the table to see the devastation that a continuation of this level of inflation will cause. Inflation is bad enough, but it is worse when inflation is rapid and there is no economic growth. In July the “official” U.3 Unemployment Rate fell from 7.6% to 7.4%, not because there was a lot of job creation, but because of the way long-term discouraged workers are counted and because the labor force participation rate shrank to 63.4% from 63.5%. Had the labor force participation rate remained at the pre-financial crisis level (66%), the U.3 Unemployment Rate would be 11%! July’s U.6 Unemployment Rate, which recognizes the part-time issue, stands at 14%. Non-farm payroll employment including both full-time and part-time jobs, is still two million below the ’08 peak. As played up on several blog sites (e.g. Zerohedge) and even in the mainstream media, of the 953,000 jobs created in 2013, 731,000 or 77% were part-time. Some blame this on the approaching full implementation of Obamacare. While proof is only by association, it appears that the part-time issue has worsened as the full implementation date draws near. Inflation appears already ingrained with double digit rates common in most major metropolitan areas. With a biased CPI measurement, there is little media mention of rising prices. Unfortunately, both monetary and fiscal policies continue to promote higher inflation levels, while the economy continues to sputter, barely producing positive growth (if, indeed, even those numbers are to be believed). The labor market, the real measure of the country’s economic engine, continues in neutral, at best. As in the 70s, today we have “stagflation.” Back then, political campaign buttons read “W.I.P.” – “Whip Inflation Now,” as the politicians recognized a need for action. Today, we are told that the labor markets are strengthening and that inflation is benign. Clearly there is little recognition of the stagflation issue and even less resolve to combat it. Anyone with money in Steven Cohen’s SAC Capital Advisors would be foolish to keep it there, even if they are sure the company will beat the Justice Department’s indictment. That’s because those funds could become subject to a forfeiture action. The issue here is the very use of the indictment, not the veracity of the allegations. The Justicee Department knows that the use of indictment process itself is likely to shut down the hedge fund company. The Justice Department is charging SAC of hiring employees who had access to people who might possess inside information, or of paying incentives for trading ideas that turned out to be profitable, as if these activities, in and of themselves, were crimes. One allegation, that the firm failed to use effective compliance procedures to prevent the use of inside information, may be valid, as there have been several confirmed insider trading incidents, and the firm has agreed to a substantial $616 million fine as a result. But, doesn’t the fine settle the issue? Isn’t that what a settlement agreement is all about? Is there sufficient provocation to wield power which, when used, is almost certain to shut the company down without real due process”. Let’s go back to the Enron accounting scandal. In 2002, the Justic Department indicted accounting firm Arthur Andersen for obstruction of justice and obtained a conviction because Arthur Andersen had destroyed Enron documents at the conclusion of its audit. The indictment itself effectively put Andersen out of business, and 28,000 jobs were lost. In 2005, however, in an unusual unanimous decision, the Supreme Court overturned the “obstruction” conviction, indicating that Andersen was operating within its document-retention policy and that it could not be concluded that obstruction had occurred just because documents had been destroyed. Because the Justice Department recognized that its indictment process alone had unintended consequences, it has since used something called a “deferred prosecution agreement” which suspends an indictment as long as the company works diligently to comply with laws or regulations. Why isn’t the deferred prosecution agreement being used in the SAC case, especially since there is no indictment of Mr. Cohen himself and settlements have been reached in the insider trading allegations? Just as an exercise, let’s compare the regulatory record of SAC Capital to that of JPMorgan Chase (JPM) (JPM). In March, SAC agreed to pay a record $616 million to settle insider trading cases. But, that amount pales in comparison to the $16 billion that JPMorgan Chase has paid in litigation expense over the three years ended Dec. 31 as documented by Matt Taibbi in Rolling Stone. He catalogs no fewer than 13 prosecutions and settlements with regulators plus a multitude of settlements in civil actions. “There have been so many settlements with so many agencies around the world … that they’re almost impossible to count,” he wrote. Yet, despite these ongoing regulatory issues at JPMorgan Chase, CEO Jamie Dimon is President Obama’s “favorite banker” and was seriously considered to succeed Tim Geithner as Treasury Secretary. I am not a fan of SAC Capital or any of Wall Street’s too-big-to-fail institutions and have frequently expressed my displeasure with their greed and abuses. Here’s the question I’m asking: Is the Justice Department using brute-force indictment power on SAC in order to quell criticism that it has handled Wall Street with kid gloves and that no CEO on Wall Street has been prosecuted, much less convicted, since the financial meltdown five years ago? (Lehman Brothers, Bear Stearns, Washington Mutual, Wachovia, Merrill Lynch, MF Global.) The answer to the question appears to be: yes. After all, SAC is a big name Wall Street firm, but it only has 1,000 employees. Shuttering it is not likely to have major consequences (although it does account for 3% of Wall Street’s trading volume). Not so for JPMorgan Chase. With more than 260,000 employees, the direct use of the indictment power would have systemic implications. Dictionary.com defines pride as “an inordinate opinion of one’s own dignity, importance, merit, or superiority.” And nowhere was pride more evident than last week in the confrontation between the Washington, D.C., City Council and Wal-Mart (WMT). Pride got in the way of both sides, turning what was at least three years of hard work and promise for Washington redevelopment into a political fiasco. Wal-Mart has a reputation of using its size and economic power to get its way. Today we call that “bullying.” Ask any vendor about margin squeeze. Ask any community banker with a Wal-Mart account about negative float. Until recently, Wal-Mart’s business model kept its stores in rural and suburban areas. But over the past few years, sales growth in the U.S. has stalled. So Wal-Mart has sought to put stores in urban areas. The governing councils in large cities, however, tend to have more liberal-minded majorities with ties to unions and sympathy toward small business. Wal-Mart is non-union and has a track record of driving out small business when it arrives in a market. It has been rejected by the New York City Council and apparently gave up on stores in the Boston area last year. When it came to Washington, however, Wal-Mart appeared to have turned over a new leaf. Working closely with Mayor Vincent Gray, Wal-Mart established the “Community Partnership Initiative” to help the city. Last year, through its foundations, Wal-Mart contributed $3.8 million to charitable organizations in Washington, including those helping the poor and homeless. “This agreement represents an unprecedented citywide commitment from a retailer… Wal-Mart is showing what it means to be a good corporate neighbor,” Gray said. With the blessing of the city, Wal-Mart decided to build six stores in Washington — three stores under construction and three in planning. The stores would mean 1,800 direct new jobs, and 3,000 jobs when multiplier effects are added, plus 1,000 temporary construction jobs. At least three of the stores are crucial to economic redevelopment and renewal in the Washington neighborhoods of Sykland, Capitol Gateway, and New York Avenue. Last week, the council, caving to political pressure, passed an ordinance aimed at Wal-Mart. It requires companies operating in spaces of more than 75,000 square feet and whose sales are more than $1 billion annually to pay a minimum wage of $12.50 an hour. The current minimum wage in Washington is $8.25 an hour. And for unionized businesses, the ordinance doesn’t apply. The accompanying rhetoric was laughable. For example, $12.50 an hour is called a “living wage” by its proponents, which ignores the obvious — if it is a “living wage” for Wal-Mart, then why doesn’t it apply to fast-food chains or other retailers? When Wal-Mart got wind that the council was likely to pass the ordinance, it returned to its proud and bullying ways, and threatened publicly to abandon the three stores in planning and reconsider whether to open the three stores under construction. The council became defensive and stubborn. Councilman Vincent Orange said the council should not condone “poverty wages” and kowtow to such threats. In the end, pride on both sides has turned the win/win into a lose/lose. For Wal-Mart, six profitable stores are now in limbo. But for the residents of certain neighborhoods in Washington, it is much worse. One blogger wrote, “1,800 jobs at $8.25/hour is still superior to 0 jobs at $12.50/hour,” and Wal-Mart has said that its average U.S. hourly wage is $12.57. So for now, no jobs, no economic redevelopment, no charitable contributions, and Washington consumers must drive to Maryland or Virginia to benefit from Wal-Mart’s low prices. It isn’t too late. The mayor has yet to sign the bill or veto it. Both sides could swallow their pride and compromise, turning the current lose/lose back into a win/win.